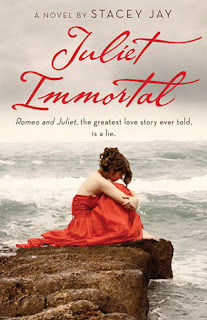 Juliet Immortal by Stacey Jay takes the premise of Romeo and Juliet in a new way. In Jay’s version, Romeo betrays Juliet by killing her in exchange for immortality by dark forces. Juliet’s soul is saved by good spirits who give her the task of bringing soul mates together. Juliet fights for true love for hundreds of years while Romeo tries to break lovers apart. Romeo grows ruthless and evil over time while Juliet becomes stronger and fiercely protective of her charges. In her latest mission, Juliet must find true love for Ariel Dragland. Ariel is a shy outcast with a disfiguring scar on her face. She thinks that she’s ugly and weird and no one would ever want her. Romeo in turn inhabits the body of Dylan Stroud, one of Ariel’s classmates so that he can sabotage Juliet’s attempts. Juliet works hard at raising Ariel’s self esteem by repairing her relationship with her estranged mother and getting a new friend in a transfer student named Ben. It’s gets complicated when Juliet starts to have feelings for Ben, who she thinks is intended for Gemma Sloop, Ariel’s best friend. Also, Romeo attempts to woo Juliet but she’s suspicious of his real intentions. I was really sold on the premise of this book so it has been on my book list for quite some time. I got it from an Amazon voucher that Jon Bear gave for my birthday. THANKS JON BEAR! I thought the book was interesting and a unique. I’d never read a retelling or continuation of Romeo and Juliet before. I liked how Juliet was so feisty. She was not the swoony thirteen years old from hundreds of years ago. Juliet also seemed to have an intense hatred of Romeo which was understandable because he did kill her in this version. I liked how she never forgot that part. I also liked Romeo’s characterization and how warped he was from years of evil deeds. He’s more like a demon than a person. I enjoyed reading his attempts to win Juliet back with his empty words. Romeo tries to romance Juliet ,by telling her how beautiful she is and how he misses her but he doesn’t really mean it….at first… He seems to be a bit insane too which was entertaining to read. The romance in the book was like a roller coaster ride even though it was obvious what the pairings would be. It was more of the supernatural forces at war that made the love story more thrilling. I liked the climax of the book the most, which was satisfying and a little sad. Juliet gets her happily ever after but it’s a little skewed. The good spirits are called the Ambassadors and the villains are the Mercenaries. The good side is not that good which added an interesting element. I felt bad for Juliet as she had already suffered enough. I felt sorry for both Romeo and Juliet too, as they were pawns in the war between good and evil. There wasn’t much detail on both the good and evil sides which I hope it is remedied in the sequel, Romeo Redeemed. I’m looking forward to reading Romeo Redeemed. I think that there might have been too many fantasy elements in this book. There are even parallel worlds added as a plot twist which I would have cut out. It makes the story more complicated than it has to be. However, I can see that it was added to illustrate that the Ambassadors didn’t care if they lost in one place because they could always go to another place. Juliet Immortal is a fun read. It’s not great literature but it is entertaining. Stacey Jay was excellent in building a story around Shakespeare’s tragedy in a unique and creative way. Juliet is a very strong heroine and Romeo is brooding, insane and evil heart throb. This book would be appealing to young people who like star crossed lovers and fantasy. I have heard of this book but it has only been getting mediocre reviews from what I have seen. It seems like it was interesting to see it as a retelling and how the characters would handle their situations, but that the fantasy was a little bit too heavy in the book. There are some flaws in this book that I can see why it would receive mediorce reviews. Stacey Jay does cram a lot of different genres into the book which means its sort of all over the place.